Nearby Attractions Mumbles Lifeboat Station - Mumbles Lifeboat Station is positioned adjacent to Mumbles Pier on the edge of Swansea Bay, South Wales. The Mumbles lifeboat station has a remark...... Mumbles Lighthouse - Mumbles Lighthouse sits on the outer of two islands, known as Mumbles Head, lying about 500 yards to the E.S.E. of the mainland known as Mumbles, ...... Bracelet Bay Beach - Bracelet Bay is located between Mumbles Headland and Langland on the Gower peninsula, Swansea, South Wales. 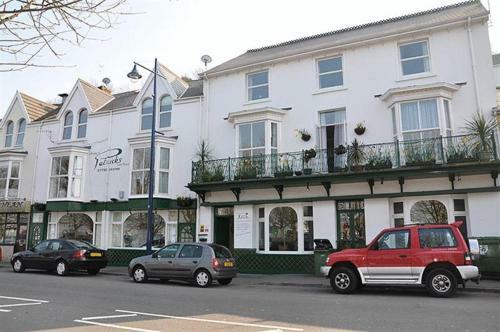 Just round the corner from the flat beach...... Gower Explorer - A family run business established in summer 2003, our aim is to provide a breathtaking, interactive tour of the South Gower Coast, leaving our passeng...... Mumbles Rugby Club - Mumbles RFC clubhouse has a wide range of rugby memorabilia. It has two bars to which visitors are as welcome as members and locals, and provides an i...... Coakley's Fishmonger Swansea - Extensive range of locally caught fish and shellfish, including seabass, conger eel and lobster. | Opening Times: 9.00am-5.00pm, Monday to Friday...... Oystermouth Castle - Oystermouth Castle is located in a beautiful location on the hill in Mumbles, overlooking Swansea Bay. Oystermouth Castle was used as the residenc...... Swansea Bay Rider - Come and enjoy a trip along the wonderful sweep of Swansea Bay as the Swansea Bay Rider returns to the promenade! The train runs between Blackpill a...... Langland Bay to Caswell Bay Walk - This walk is in Langland near Mumbles on the Gower peninsula south Wales. It takes approximately 1.5 hours (Distance 2.25 miles / 4 km). On this w...... Langland Bay - The road leading down to Langland Bay is very steep and it is a cul-de-sac, so parking could be a problem in the high season. Add your attraction to our directory of Piers, or update an existing listing.